I am happy to greet you in the official website of the National University of Architecture and Construction of Armenia. Since 1921 our University with its quality of education and gifted in various spheres specialists has been proving that it firmly stands by the side of urban construction, preservation and protection of our historical heritage and on the path of the creation of novelties. Yesterday, today and undoubtedly tomorrow our University will educate generations of graduates who will have their contribution not only for the development of local but also for the growth of international Architecture and Construction. Hundreds of overseas students studying at the National University of Architecture and Construction of Armenia, our awards earned in numerous international competitions and the recognition of our diplomas in many progressive countries keep high the dignity of our educational cradle and witness the fact that the National University of Architecture and Construction of Armenia is amongst the best educational institutions in the world. We welcome each and every student to the National University of Architecture and Construction of Armenia and strive to make the secrets, specifications, and practical realization perspectives of chosen specialization accessible by our long-term experienced lecturers and honored professors. 1980 Graduated from the Industrial and Civil Construction Department of Polytechnic Institute after Karl Marx. 2008 Scientific degree of the candidate of technical sciences. 2011 Doctor of technical sciences. 1974 The first construction administration of “Erardshin” (Yerevan Industrial Construction)Trust, a worker. 1975-1985 The first construction administration of “Erardshin”(Yerevan Industrial Construction). Trust as a master, then a supervisor. 1985-1995 Head of the 31st (previously the first) construction administration of “Erardshin” (Yerevan Industrial Construction) Trust. 1995present “Horizon 95”, founder of construction company, President. 2001 “Arkhmonstroy”, founder of construction company, President. 2009 “Horizon Trade”, founder of construction company, President. 2008 present Professor of the Construction Industry Techologies and Management department at the National University of Architecture and Construction of Armenia. 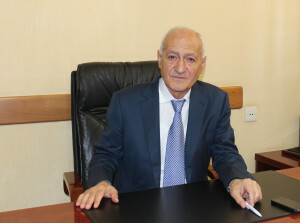 2014 present Rector of the National University of Architecture and Construction of Armenia. No 3 Building of Government. Sessions’ Hall of the RA National Assembly. Hall of Sessions of the residence of Nagorno-Kharabagh Republic’s President. Airport in Stepanakert (Nagorno-Kharabagh Republic). Banks: RA Central Bank, capital reconstruction, “ARMECONOMBANK”, “PROMETEY BANK”. New “Paramaz Avedisyan” building of the American University of Armenia. Residential, trade, administrative and public complexes in Yerevan city. Resort and hotel complex in Jermuk city. Mayak, Basalt and Astro plants, production complex of “Lyux” shoes factory, “Neyron”, “Hrazdanmash” and “Lazer Technic” research and production centers; Electrotechincal Department of Politechnical Institute; First Aid Hospital in Nor Norq district, some schools and kindergartens in Nor Norq and Dzhvezh districts of Yerevan, reconstruction of Yerevan Opera and Ballet Theatre in 1983, the reconstruction of Lazaryan Seminary in Moscow in 1985, active participation in reconstructional works in Spitak Earthquake zone, also reconstructed the first reopened kindergarten, school and other structures in Vanadzor. Reconstructional works of divisions of several hospitals; reconstruction of “Moscow” cinema, elite residential houses and complexes in the center of Yerevan (in Bayron, Teryan, Tumanyan streets and Northern Avenue), medical center in Davitashen district. Reconstruction works of St. Sargis church in Nor Norq, Open Altar in Mother Cathedral, Arshil Gorky Museum, Gevorgyan theological seminary, new administrative building of Mother See of Holy Etchmiadzin, new baptistery of the Armenian Apostolic church, new church of Saint Archangels (“Srbots Hreshtakapetats”) and other renovation activities in Mother See of Holy Etchmiadzin. 2006 “Anania Shirakatsi” medal awarded by the RA President for significant contribution and quality in construction industry. 2007 Honorary title of the State Prize winner of the Republic of Armenia for the building of Yerevan Municipality. 2008 Golden medal awarded by the RA Ministry of Urban Development for significant contribution and quality in urban construction industry. 2008 “Nerses Shnorhali” medal of honour awarded by Garegin II Catholicos of all Armenians for the considerable contribution in the sphere of church construction. 2009 Golden Medal of NUACA “Honours to the Engineer” for significant achievements in the construction sphere. 2010 Medal of honour of the National Assembly of the Republic of Armenia for the refurbishment of the NA Sessions hall. 2011 “Grigor Lusavorich” highest medal of honour awarded by Garegin II Catholicos of all Armenians for the considerable contribution in the sphere of church construction. 2011 Medal “Anania Shirakatsi” awarded by the President of Nagorno-Karabakh Republic for significant contributions in construction industry. 2012 Golden Medal awarded by the decree of the RA Prime Minister for the investment and development of innovative technologies in the sphere of construction. 2012 Knight of Italy order awarded by the President of Italy Giorgio Napolitano for the contribution in Armenian-Italian business ties and cooperation. 2013 Golden Medal of Mayor of Yerevan city for the significant contribution in the development of the capital city, long-term and dedicated job. 2015 Yerevan Municipality “Argishti the First” medal on the 2797th anniversary of the capital for the contributions in the spheres of science, education and construction. 2016 the 2-nd class “Medal of Services to the Motherland” awarded by the RA President on the 95th anniversary of the National University of Architecture and Construction of Armenia. 2016 the medal for “Services in the Construction Sphere” awarded by the Builders’ Union of the Russian Federation. 2016 the “Medal of Services in the Fields of Construction Education and Science” awarded by the Moscow State University of Civil Engineering. 2017 “Drastamat Kanayan” medal awarded by the RA Minister of Defense for supporting the works aimed at reconstruction, restoration and fostering the construction objects of the Ministry in the framework of the NUACA and MoD co-operation. President of the RA Builders’ Union. Honorary member of the RA Architects’ Union. Honorary title of Russian Engineer awarded by the Russian Engineering Academy. Military rank is reserve captain. 43 scientific and 2 educational-methodical works.